If you have ever heard the phrase, ” Attitude is everything”, then perhaps you have read one of my favorite books, “Attitude is Everything”, by Jeff Keller. One two my favorite quotes from his book were, “There it is nothing good or bad but thinking makes so”, written by William Shakespeare and, ” you can’t always control circumstances, but you can control your own thoughts””, written by Charles Popplestone. What a great read for those who haven’t read it. You can find it here. 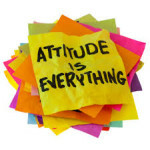 One of my other favorite authors is Chris Brady, who wrote an article on attitude. I have included it below for those interested in reading it. Enjoy. It’s not what happens to you, it’s what you happen to do with what happens to you. I am impressed by many people, especially those who have a great attitude, seem focused on others, and make me feel good by just being around them. Often, however, I have been surprised to eventually find out that the person behaving in this admirable way has had anything but an easy life. In one case, the couple had lost a teenage child, in another, one had battled cancer, in yet another, family financial challenges were nearly taking them under. Yet, in spending time with these people, none of these burdens were obvious, no complaints were forthcoming, and negativity seemed to have no place in their vocabulary. Contrast this with people who are not happy unless they are unhappy; those who appear hard-wired to focus on the downside of everything, complaining about this slight or that perceived unfair situation as though they were the world’s #1 victim. Why, in a culture and time in which people are so blessed, are so many full of complaints? In my opinion, the difference stems from a person’s perspective on events, and how he or she responds to the challenges of life. Bad times and hardships skip no one. Sickness, death, relational struggles, and other frictions of life do not single out particular victims. We are all swimming in the same soup. Realizing this is a major step toward maturity and will go a long way to improving your relationships and attractiveness. Peculiarly, negative people don’t think they are negative. If they admit to any impertinence at all, they will usually say they are merely being “realistic.” This is a non sequitur, because their perspective on reality is warped by their ungratefulness, and they are no more infallible than anyone else when it comes to defining true reality. 1. Realize that it’s not what happens to you, but how you respond that counts. We all have it tough in some way(s), so stop comparing yourself to others and begin tracking your own personal growth, instead. 2. Never stop counting your blessings. The truth is, your every breath is a gift. 3. Don’t take yourself too seriously. It’s refreshing to come across someone who is truly humble. 4. Look for good in people and situations. You will be delighted by the surprising treasures you’ll discover. 5. Become “other” focused, and think about how you can serve rather than receive. Sacrifice is a surprising paradox that serves the server as much as the served. 6. Consider your mortality, and operate with an eternal perspective. This involves prayer and worship, and being more concerned with whose you are than who you are. 7. Treat being flexible as an open invitation to unplanned adventure. It’s the unexpected that often thrills us the most. Be open to it. 8. Find your purpose in life and pour your efforts into it. Work barely seems like work when you’re doing what you were built to do. Do what you were meant to and do it with a purpose. 9. Forgive quickly, and forget even faster. Carrying grudges only builds muscles of bitterness. Lighten up by dropping that load. 10. Be present wherever you are. Multi-tasking is a thief, robbing us of joys and stealing our ability to focus and create clear memories. If you’re with your kids, be with your kids. If you’re at work, be at work. Stop splitting yourself into little worthless pieces. And there is probably an eleventh: Don’t read too many blog articles like this one where the author preaches at you as if he’s got it all together himself. Nobody is that good!